After watching Notorious a couple of weeks ago I decided to watch an interview with Alfred Hitchcock circa 1972. With his usual candor, he explained why he had always gravitated towards making films about ordinary people involved in extraordinary circumstances. The interest, he said, was not only a matter of personal taste, but an attempt to make films audiences could relate to. 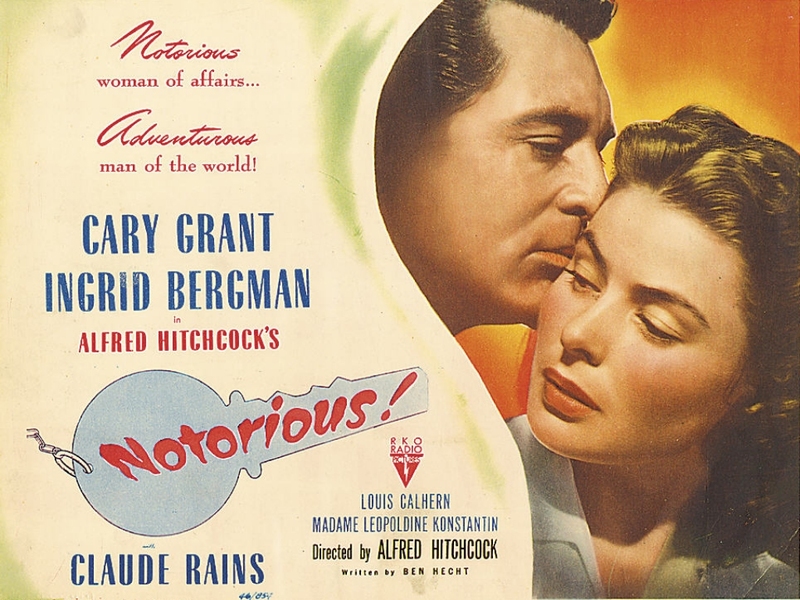 Though one could argue about the veracity of his statement, Notorious is one of those films that could very well be interpreted along those lines. The leads may not be fulfilling “ordinary” roles, but their desire and attraction to each other speak to the minds and hearts of the common people, resisting the parts they have to play in the story as much as they can since it means the sacrifice of their more basic and primal instincts for each other. The story begins with Alicia Huberman played by the ever radiant Ingrid Bergman. She is the orphaned daughter of a well known Nazi sympathizer who is vocally opposed to her father’s world views. At her father’s funeral she is approached by Devlin, a suave intelligence officer played by Cary Grant, with a proposal: if she is to sever the ties to Nazi Germany once and for all, she is to infiltrate a Nazi cell located in Rio de Janeiro to obtain critical intel. Despite the imminent danger they face as they travel to Brazil, the two quickly hit it off and act as if they were young teenagers who profess love after their first kiss. Thinking of what is to come, Devlin comes to his senses and distances himself for no other reason than to save each other a lot of heartache. As an intelligence officer, he is better equipped to know how hard it will be for them, choosing duty over love to spare each other of more trouble. Nearly heartbroken by his behavior, Alicia decides to focus on the mission ahead by way of rekindling the interest of an old admirer, Alexander Sebastian (Claude Rains), who happens to be in the midst of the Nazi cell hiding in Brazil’s bustling coastal metropolis. At first, Alexander seems doubtful and apprehensive, but in time the incomparable beauty of Alicia clouds his judgment. The real tragedy is that Alicia must continue to play along until the intelligence officers have enough to move forward. She sacrifices her body and mind and she does so with a heavy heart, thinking the man she truly loves does not feel the same way. What is interesting is that her choices in Rio seem to be a response and a challenge to Devlin, rather than a noble patriotic act. Of the six films I have covered in my Hitchcock marathon, Notorious is the most troubling of the pack. The subject matter implies the complete and utter degradation of a woman as little more than an object to serve a country of men. Alicia is “handed” to the arms of a man she does not love. The film is not so much a tragedy, but an extremely gender-biased exploitation, where Hitchcock and writer Ben Hecht show just how skewed and troubling their views of women were. 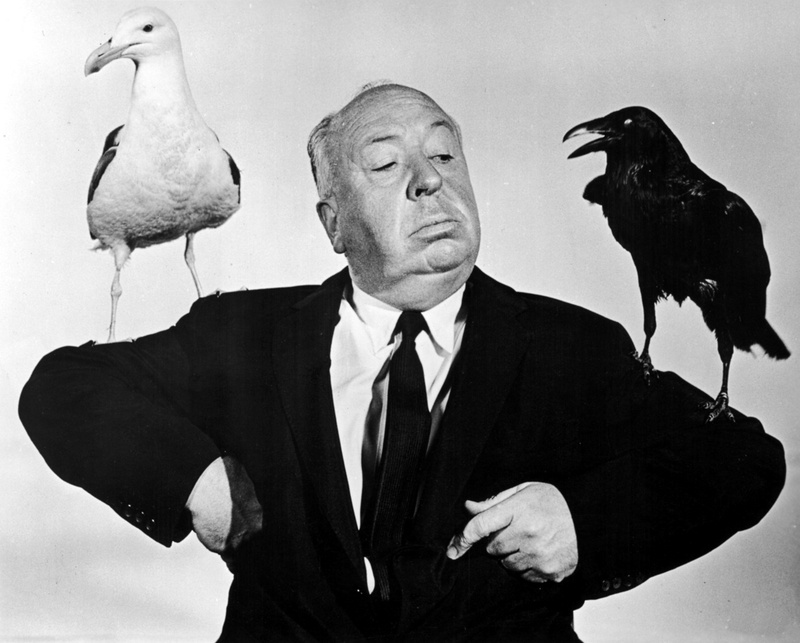 Like the rest of Hollywood at the time, Hitchcock sought to craft motion pictures for men. Though most of the memorable characters he created were women, their roles in his films were limited to two possible types: the conniving seductress, or the damsel in distress in need of saving. 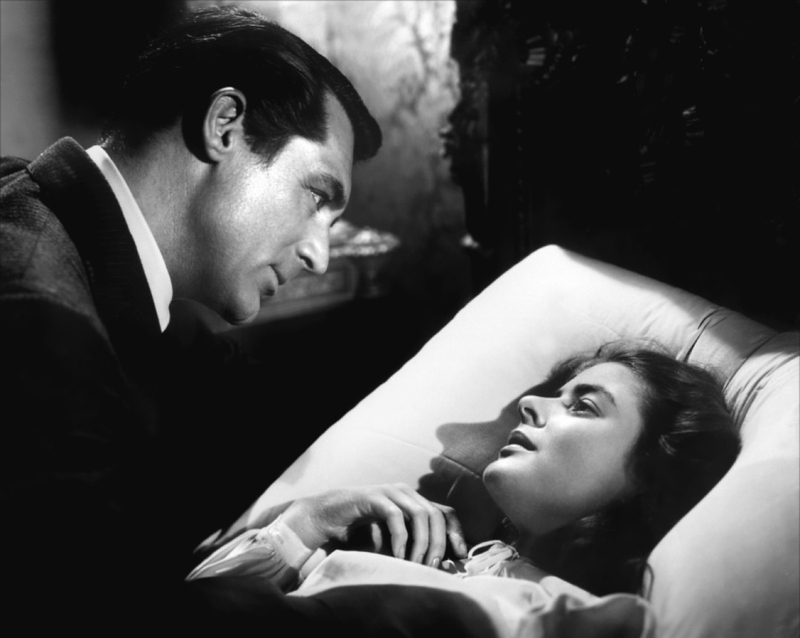 While Kim Novak played the victimizer in Vertigo, Ingrid Bergman plays the innocent princess in Notorious. Thankfully, by centering the story of most of his films around women, Hitchcock empowered them on the screen, even if they played roles that were still limited and secondary to men. The master of suspense’s views on women were not altogether simplistic or negative either. In fact, most of the beautiful women in his films were remarkably intelligent, more or less capable of constructing their own path. What makes Notorious the least effective film of the six films I have had the pleasure to review in this marathon is that the romance at the core of the story is not altogether believable. At first it seems forced if not completely made up. In fact, the moment in which Cary Grant and Ingrid Bergman first kiss is completely surprising. The relationship between the two did not seem to suggest it, and neither did their body language. One can almost think that they were both measuring each other up, pretending to be in love to see which one would take the bait. 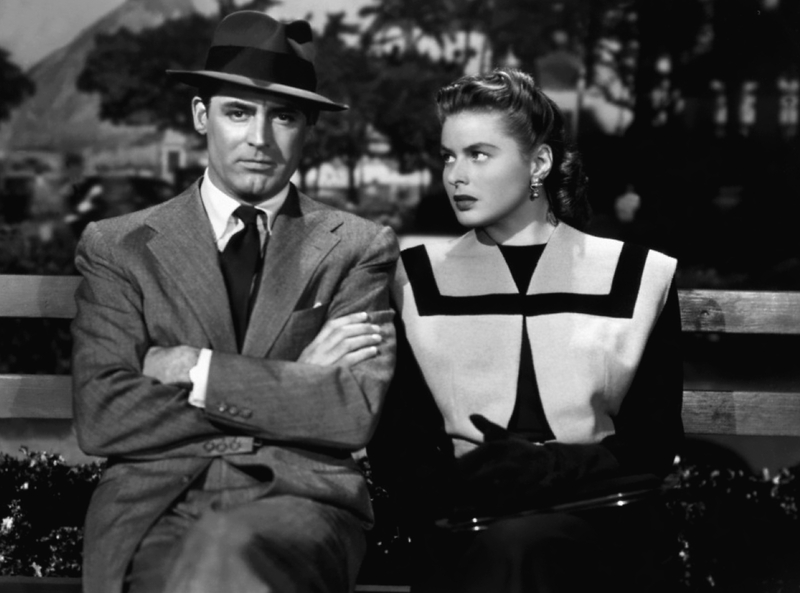 The chemistry between the two famous actors does not seem to be there, especially if compared to the tender and effortless chemistry between a slightly younger Ingrid and the incomparable Humphrey Bogart in Casablanca. Though Grant plays to his strengths as the suave man’s man, his delivery is a lot more restrained and less flirtatious than in some of his other films, never quite connecting with Bergman, and remaining on the fringe of the central story until the final act. On a film relying so heavily on the believability of a romance, Notorious feels forced and the least ingenious of all of the Hitchcock films I have seen so far. This is not to say Notorious is a bad flick. After all, a relatively poor Hitchcock piece is still a hell of a lot better than most films out there. Great review, Niels. You bring up some interesting points, particularly the degradation of Bergman’s character. I really enjoyed the film when I saw it last year, and I’ve been wanting to give it another watch. I’ll have to do so with your notes in mind. It’s been interesting to find some common themes in the work of Alfred Hitchcock. By becoming more acquainted with his work, you certainly begin to understand him, not only as a director, but also as a person with very particular views. I think his films just become more and more interesting the more I watch.